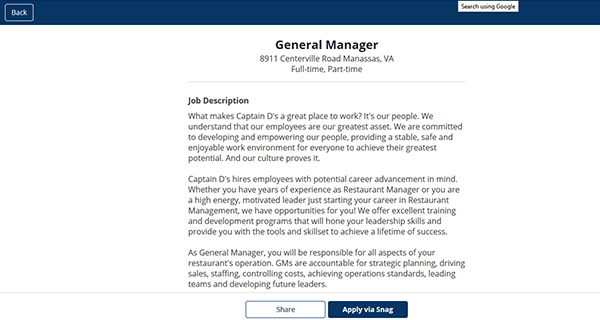 The Captain D’s job application can be found on the company’s main employment site. Use the links/buttons provided on this page to go directly to the company’s careers page. Once you’re on the careers page you will be able to search the list of current openings, create a job portal account, and submit applications for positions that you are interested in. The guide posted below provides a general overview of the company’s online application process. About the Company: Captain D’s is an American chain of fast/casual restaurants based out of Nashville, Tennessee. The company was formed in 1969 and currently has more than 500 locations (and employs over 6,000 people). 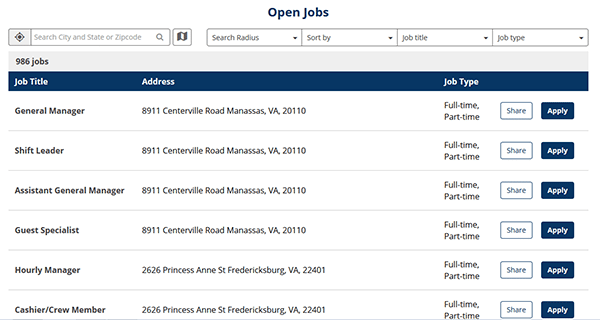 Step 1 – Click here to open the Captain D’s job application link in a new tab/window. Note: Clicking the above link will open the company’s main employment page in a separate browser window/tab. If you want to go directly to the company’s employment site (in this current tab/window) then scroll up and hit the blue button on this page. Step 2 – Scroll down the page until you come to the job search form. Fill out the form and then click the search icon/button. The list of results will load below the form. Step 3 – Press the job title link of the role that you’re interested in submitting an application for. Step 4 – Read the job description sections and then hit the button that’s outlined in red in the below screenshot (to go to the next part of the process). Step 5 – Fill out/submit the Captain D’s online application. Note: You may be required to create an account.